Download freeware software demo for evaluating its features and functions, if satisfied feel free to place order for licensed version of bulk sms software for GSM phones. Professionally designed Bulk SMS Software for GSM Mobile Phones is used to send instant (multiple) text sms from computer system (any of your Laptop or Desktop systems) to other cell phones supported by GSM technology based mobile phone in a short duration without requiring any internet gateway. 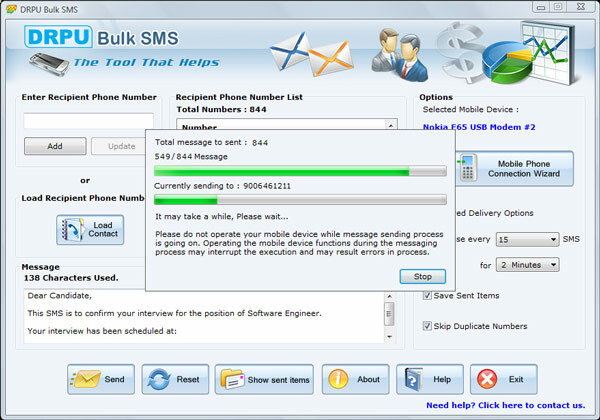 Bulk message broadcasting software is used to send mass sms related to Business marketing, Product marketing, Advertisement, Job alerts, Requirement notifications, Season greetings, Invitations, Business campaigns, Event alerts, Invitations, Stock updates, Market update news, Personalized sms etc to all selective or group of cell phone users at both national and international mobile networks without requiring internet connection. Bulk SMS messenger utility is useful utility to establish communication with larger audience (including your employees, relatives and friends) by sending messages in all Unicode supported languages (regional language). Send SMS to voluminous list of phone numbers. Very easy sms sending procedure with option to import phone number list from Text file/Excel file format saved in PC. Compatible with GSM technology based mobile devices like Nokia, HTC, Samsung, Sony Ericsson, LG, Motorola etc. Easy mobile phone connection wizard delivers messages to worldwide cell phone users. User can view sent item details for any future reference. Provides delayed delivery option to minimize the load of sms. Send group text messages to make easy communication between sender and receiver. Send unlimited text messages at both national and international mobile network. Provides user friendly GUI facility that makes process easy to use. No monthly charges or setup cost required. Software can be easily installed on all major Windows OS including Windows 7, Windows Vista, Windows XP, Windows Server 2000, Windows Server 2003, Windows Server 2008 etc.